This is a great recipe that the family can get involved with in the run-up to Christmas. Making your own mince pies together is a memory your children will grow up remembering fondly, but you might find it easier to make the filling ahead of time. This filling can be kept for a year or more but is best eaten within six months. Oh, and you can leave the brandy out if you wish. Or add more if you prefer. Oh go on! It’s Christmas! Put raisins, currants, sultanas and suet into a very large bowl. Stir. Peel and finely dice bramley apples and add to the bowl. Stir some more. Add the mixed peel, along with the zest and juice of the lemon and orange. Stir even more. Add the demerara sugar and spices. Keep stirring. Finally, add the brandy and stir, stir, stir! Cover the bowl and set aside for 24 hours, stirring every now and then whenever you walk by/fancy a whiff of brandy. After 24 hours store in sterilised jars and label with the date made. 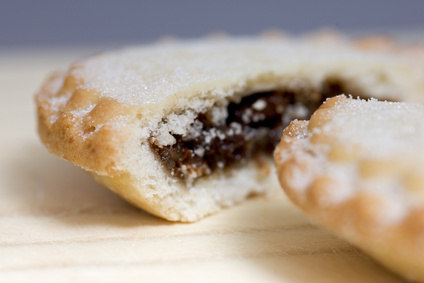 Your mincemeat filling is now ready and waiting for your marathon mince-pie making session! Click over to here for the pastry recipe. Remember the guy who sued his wife for having an ugly child? True story, hoax or successful PR?